More Than Sound’s collaborative photo series on Instagram, #MindfulFilter, is back from hiatus just in time to celebrate the Dalai Lama’s 80th birthday! The Dalai Lama only had one birthday wish – be a force for good. Good deeds come in all shapes and sizes, and no act is too small. 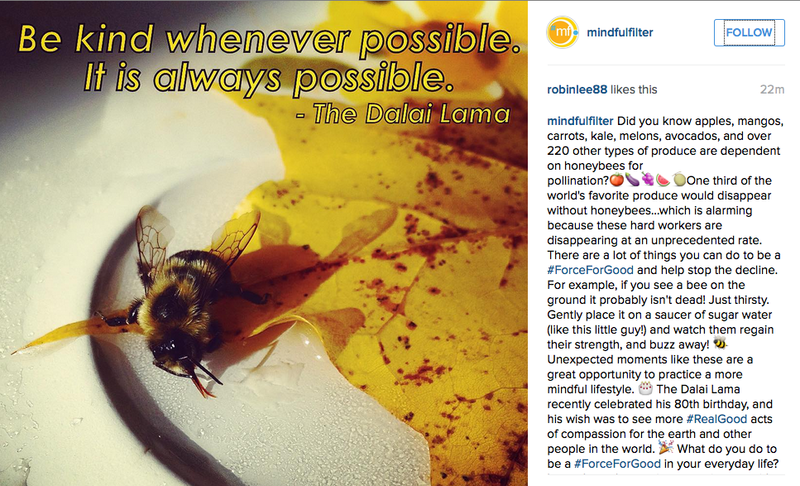 Our latest Instagram post concerns the decline of the honeybees, which would fall under embodying compassion, choosing human economics, and healing the earth. A compilation of different forces for good can be found here. Business Insider tells us, “A world without honeybees would also mean a world without fruits, vegetables, nuts, and seeds.” One third of the world’s produce – from apples, limes, and mangos to zucchini and squash to celery and leeks to broccoli and kale – would disappear from the shelves should the honeybees decline continue at its current pace. A Rhode Island Whole Foods grocer imagined what the world would look like without bees, and took 237 of 453 products off their shelves. Over half of their produce department was empty! BBC also has a fantastic page loaded with infographics about bees. Chensheng Lu, Kenneth Warchol, and Richard Callahan at Harvard’s School of Public Health have all but closed all debates about the reason for the decline of the honeybees. Unsurprisingly, sub-lethal exposure of pesticides (specifically neonicotinoids, imidacloprid, and clothianidin) and the general state of contemporary mass agriculture caused the colony collapse disorder (CCD), starting around 2005. These insecticides exist in high levels in planter exhaust materials when plants are treated. Honeybees in both the control and neonicotinoid-treated groups functioned normally in the summer and fall, but half of the neonicotinoid-treated groups abandoned their hives and died by the end of the winter. The control colonies, in contrast, thrived and re-populated after the winter, with the exception of one that died due to infection. Their article was published in last month’s Bulletin of Insectology. In addition to pesticides, bees are also declining due to diseases, parasites, habitat loss, weather, and the stress that comes with constant transportation between orchards to pollinate. The collapse of honeybees is apparent and impending, and we have few prevention measures set up. The Farm Bill passed in 2013 and only allocated less than $2 million a year for emergency assistance. Don’t fall into despair, though. There are plenty of things you can do in your own backyard to help. Plant bee friendly flowers and herbs. Spring – lilacs, lavender, sage, verbena, wisteria. Summer – mint, cosmos, squash, tomatoes, pumpkins, sunflowers, oregano, rosemary, poppies, black-eyed Susan, passion flower vine, honeysuckle. Fall – fuchsia, mint, bush sunflower, sage, toadflax. If you’re financially capable, buy local, organic food from farms in your area. Shop at farmer’s market and local grocery stores. Get a CSA (Community Supported Agriculture) share. Learn how to become a beekeeper and look up local bee associations that offer classes with natural approaches. Morgan Freeman’s doing it, and you can too! Don’t use chemicals and pesticides in your lawn or garden. Understand the differences between wasps and honeybees. Wasps are carnivorous. They want to steal your turkey sandwich and sodas. They will sting you without hesitation because they know they won’t die. Honeybees are vegetarians, so as long as you aren’t eating pollen for lunch, chances are they aren’t interested in you. They will only sting you if they feel threatened, and will die soon after. They don’t want to sting you! Stay still if one is near you. If it lands on you, chances are you smell sweet or remind them of a flower! That’s sweet, if you think about. Imagine them as a weird, flying dog and let them sniff you out until they realize you’re not a flower. Then they’ll be on their way! If you see a bee on the ground, chances are it isn’t dead but will be soon. Gently transport it to a small saucer with sugar water so it can regain strength and continue on its way. Put a small basin of water outside your home with little stones and marbles to crawl on so they can drink. Spread this information far and wide! It’s not just honeybees, either. Thousands upon thousands of butterflies, moths, and other types of pollinating bees are in peril. If everyone stands in solidarity with the honeybees, the powers that be will be forced to take notice and do something about CCD and the insecticides poisoning the only home we have. Available now: Daniel Goleman’s audiobook, A Force for Good: The Dalai Lama’s Vision for Our World. Annie came to America while she was pregnant to assure her abusive husband would never be able to reach their children, as being born on American soil would make them citizens. She has been waiting for her green card for seven years, terrified she’ll be deported and separated from her twin boys. They live in a small, two-bedroom apartment and her boys walk five miles to school through a questionable neighborhood to get to school every day while she works three jobs. She leaves before sunrise and gets home well after dark every day, and hasn’t had a day off in three years. Her only solace is their elderly neighbor, Rosa. She loves cooking dinner for the boys and helping them with their homework, as her own children are grown and gone. Susan is a CEO at a major corporation, and can not only afford childcare, but to have live-in assistance around the house. She can stock her fridge with the best, organic food, and her children are able to take weekly horseback riding and water polo lessons. She lives in a gated community, drives an eco-friendly car, and is able to take time off at her leisure to spend with her children. She went to college for business so she could take over her father’s corporation when he retired, and her children will never have to worry about affording a higher education. Annie and Susan are similar women who live in the same city. They’re both single working mothers. They love their two children, and work hard to provide them with the best lives possible. They are the same age, like the same music, and are both reading a Milan Kundera novel in their free time. Annie tries to order a coffee (the sole luxury she allows herself to splurge on) and is fumbling around for change at the bottom of her purse. She’s desperate to avoid the public embarrassment that comes with not being able to afford $3.92 for a drink. She apologizes profusely for holding up the line, and manages to leave a crumpled, well-intentioned dollar bill in the tip jar. Susan, behind her in line, taps her foot impatiently and audibly sighs, even though she could easily buy Annie twenty coffees without ever noticing a lack in funds. When it’s finally Susan’s turn, she doesn’t look up from her phone as she orders, and puts an X over the tip space on her credit card receipt. Why wouldn’t Susan just help Annie, or the hard-working people at the coffee shop? In Daniel Goleman’s recent book, A Force for Good, he interviewed Dacher Keltner, a psychologist at the University of California, Berkeley. Throughout his studies and a series of experiments, Dr. Keltner has concluded that in direct encounters, a person of higher status – or privilege – is significantly more prone to disregarding a person of lower status. On the contrary, a person of lower status is much more likely to pay attention and show compassion to other people, regardless of their status. “Those with few resources and fragile circumstances – like a single mother working two jobs to pay her bills who needs a neighbor to look after her three-year-old – depend on having good relationships with those may one day turn to for help,” Goleman writes. Wealthier individuals, in contrast, are able to afford help as needed – they don’t rely on the goodwill of the people surrounding them. Keltner suggests that because the rich can afford to tune out other people, they also learn to tune out the needs and suffering of others. In organizations and corporations, he observed that when high- and low- ranking people interact, the higher person avoids eye contact, interrupts, and steam rolls over the conversation. John Ogbu, the late Nigerian anthropologist from UC Berkeley, noted that Berkely had a de facto caste system, much to Goleman’s surprise. Ethnic minorities and the while middle class were centralized in different, but defined, parts of town. The schools were in between them, separating the caste lines. “The moment he pointed [the caste lines] out, I saw he was right. But until then that glaring fact had been under the social radar for me – while I was going to those very schools, I hadn’t given it a second thought,” Goleman reflects. The Dalai Lama has a lot to say on this topic of socioeconomic divides, and added the aspect of faith to the conversation. Followers of certain religions believe social order determines their destiny. If someone is in a lower class, it is because they deserve to be there. If someone is in a higher class, it is because they have a greater destiny. The wealthy and elite have many reasons for justifying their choice to ignore the needs and suffering of those around them. They displace the blame to the elect, saying change is out of their control or this is the way it’s always been (a feeble guise for their willful ignorance). They may profess “God made them [the worse off] that way,” or believe a divine being decided these people should be below them. The Dalai Lama dismisses this as totally wrong, and nothing but flimsy excuses for callousness. He calls upon people with the privilege and ability to make change to do so. “You can repeat ‘equality, equality’ a thousand times,” the Dalai Lama says, asking his followers to act, not just sympathize. “But in reality, other forces take over.” Awareness without action following means nothing. There is little empathy in the business and political leaders of today, and little thought is given to how it will affect those without access to power when they make decisions. This callousness makes the gap between the classes, between the tops and bottom of organizations, between the castes invisible. This lack of compassion becomes the norm when it isn’t acknowledged, and isn’t just a problem in Berkeley, California. It’s prevalent everywhere, and can only be changed by action. A portion of this article contains excerpts from Daniel Goleman’s book, A Force for Good: The Dalai Lama’s Vision for Our World. Is Shakespeare an iPhone or a Droid Guy? When I first saw these pictures of YOLO Juliet, a book from Random House’s “OMG Shakespeare” series, and I didn’t really have opinion. The OP didn’t appear to have an opinion either, simply posting the picture with #WilliamShakespeare. I was about to move on with my life…that is, until I saw all the comments. I was floored by the rash reactions the mere sight of these books immediately caused. It came as no shock that academics (*cough* elitists) were horrified at the “dumbing down” of Billy Shakes. Why shouldn’t OMG Shakespeare and similar texts exist? If a young student hates reading, but finds this intriguing, so be it. If someone reads this and realizes, “Hey! You know what? Maybe Shakespeare isn’t so scary or intimidating or boring. Maybe I should try reading the real play, or go see it performed!” …Is that really so bad? Even if the readers of OMG Shakespeare and the like don’t find a passion for Shakespearean text, at the very least they were reading and got a grasp of the plot/symbolism/characters etc, and classic literature continues to evolve and stay relevant. This is creative and intuitive, and targets a demographic (obviously young adults, meaning grade school students) that is constantly turned away from exploring/experiencing literature by elitists who think it’s a medium that can only be expressed one way. This is just like the negative reactions people have to Instagram, saying the app is only used to “boast about their hiking” or “spend more time taking pictures of their sneakers at the gym than working out”. I think these nay-sayers are missing the point…the person who posts these pictures climbed a mountain. They went to the gym. If applying a filter is what it takes to get you outside, take thousands of pictures! Climb those hills and Instagram all you want! I have a degree in English, Latin, and Medieval Studies. I work at a publishing firm and will be going to graduate school soon for library sciences. Even I find Shakespeare hard to read…I’m a fully grown woman trained in the art of reading! A seventh grader though? Psh, Billy Shakes was so hard! I know for a fact when I read Romeo and Juliet in 7th grade, I didn’t understand a word of what I was reading until I saw the movie. Besides which, Shakespeare was a playwright, and his pieces were meant to be interpreted and performed. Is this not an interpretation? I think this is great. And cute! If you don’t, why don’t you try opening up your mind sometime and see something from someone else’s perspective for once. Language is fluid, and how it is interpreted and conveyed constantly changes! Accept it! tl;dr: Shakespeare doesn’t care. Get over it!